From my hotel room on the 12th floor I could see the top of this Hindu Temple amidst a sea of concrete. 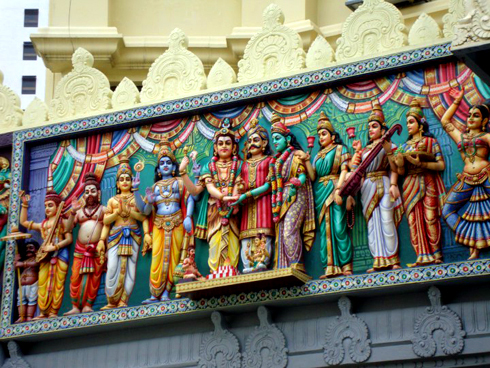 Having found a Singapore travel guide before going, I read all about the varying religions of the country and the strong Indian influence as well, so when I saw this I knew it would be worth finding. Stephanie and I travelled a little bit off the main roads and down streets that felt much more local - but in the best kind of way. It was one more thing to check off my list of experiences in Singapore. Ducks and chickens hanging in windows, cramped stores with shelves up to the roof, and people huddled on sidewalks discussing their day, it felt like an honest representation, or at least a nice balance to the glass and neon of the impressive Marina Bay district where we'd spent so much of our time already. The temple was a nice surprise. Something peaceful and out of the way. Something it felt like we discovered by circumstance. Nearing the end of our trip, it proved to be an ideal place to reflect. I remember going through your Singapore book in Vancouver with all the attractions and questioning if we would have the opportunity to really explore. There were so many amazing things. But in the business trip with many surprises, in 6 nights + 5 days we were able to experience everything we wanted plus more.